The meeting was held near where Colten Boushie was shot in the back of the head. Gerry Besse, a resident of Biggar, Sask. asks RCMP Commander Colin Sawrenko a question during an RCMP town hall on Monday. BIGGAR, Sask. — An RCMP town hall meeting close to the farm where a young Indigenous man was fatally shot in 2016 heard Monday evening from several residents confused about what rights they have to defend their property. The meeting in Biggar, Sask., was not meant as a response to last month's divisive not guilty verdict in the trial for Gerald Stanley, who had been charged with second-degree murder in the death of Colten Boushie. 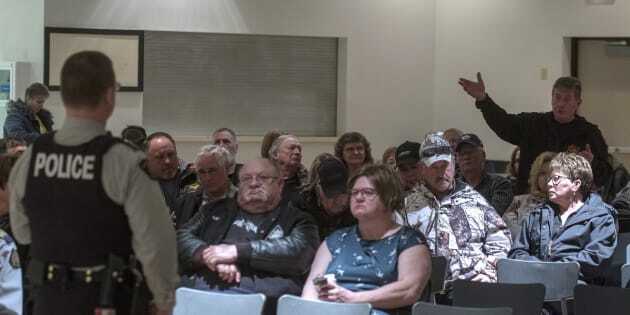 Rather, it was one of many such gatherings the Mounties plan to hold in Saskatchewan to hear residents' concerns and outline the measures police are taking to tackle rural crime. Mike Walkers, who has a ranch south of Biggar, said he has had two quads stolen in recent years. He asked Sgt. Colin Sawrenko, the commander of the Biggar detachment, what he should do if he catches a thief in the act. He asked, for instance, whether shooting a gun to scare off an intruder would be appropriate. Walkers said he wouldn't bother calling the RCMP because it takes them too long to respond. Sawrenko said the Criminal Code does provide for a person's right to defend themselves and their property, but the response has to be reasonable. He said there are so many variables at play that determining what's reasonable is tricky. Sawrenko urged anyone in Walkers' situation to call the RCMP instead of taking matters into their own hands, as police officers are trained to deal with those high-stress situations. "You are potentially creating more harm for yourself than what you intend to stop," he said. "If you can avoid a confrontation with a criminal, do it," added Staff Sgt. Greg Abbott, who represents the RCMP's central district. "I'm not saying you can't defend your life and limb and your family... (But) it doesn't matter what kind of circumstance you're dealing with — there are always, always unforeseen variables." People take part in a vigil in support of Colten Boushie's family, following the acquittal of Saskatchewan farmer Gerald Stanley on charges in connection with Boushie's death, Feb. 13, 2018 in Montreal. Walkers said he wasn't satisfied with the answers. "Between the time that the crime occurs and the time that the cops get there, well, the criminals are long gone," Walkers said. According to the officers, he added, "You can't very well do anything." Abbott told reporters the RCMP have been fielding more and more queries like Walkers' over the past year or so, due to high-profile cases like Stanley's. The trial heard that Boushie was one of five people in an SUV who were looking for help with a flat tire when they drove into Stanley's farmyard near Biggar. Stanley testified that he and his son heard an ATV start up and thought they were being robbed, so he fired some warning shots into the air. He said he then popped out the cartridge, went over to the SUV and reached in to get the keys in the ignition, when his gun "just went off." Boushie, who was in the driver's seat, was shot in the back of the head. RCMP Staff Sergeant Greg Abbott speaks to community members during an RCMP town hall in Biggar, Sask. on Monday. Many of the more than 100 people at Monday's meeting painted a picture of rampant rural crime that was at odds with RCMP statistics of reported offences. 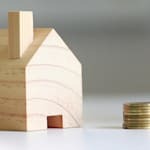 After slight increases in 2015 and 2016, property crimes dropped by five per cent in 2017. "People will probably sit and look at some of the numbers and say, 'Well that's not right because so-and-so's been broken into eight times, nine times," Sawrenko said. "But how much of that is actually being reported to the RCMP? That's the question."